Research Studios has completed the re-branding program for London’s Somerset House, one of the city greatest architectural treasures and today a vibrant site of art galleries, theatre, music performances, creative studios and many other cultural events. RS developed a new identity and a comprehensive brand system. 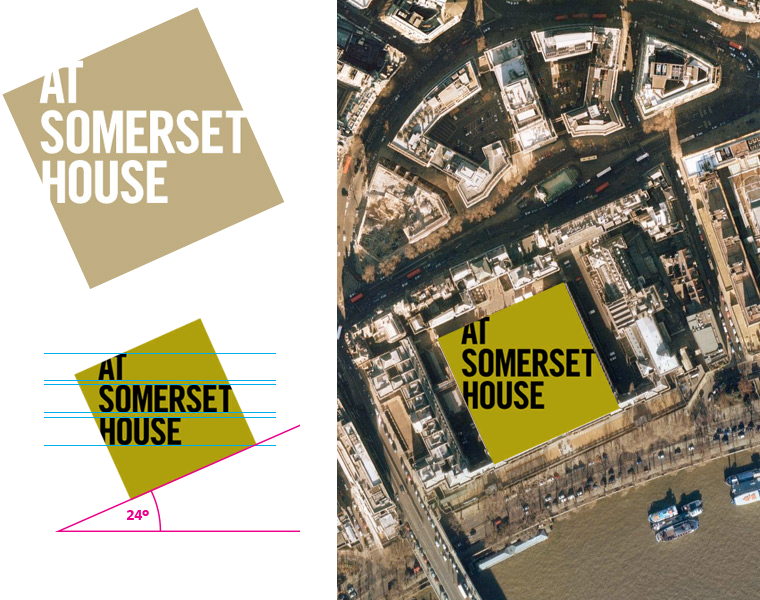 The unusual angle references the rectangular outline of the Somerset House building from a cartographic perspective. This tilted shape is proving to be a flexible vehicle that communicates both the history of the site and its very active role in London society. The “At Somerset House” square is used to house images and cut into diverse materials and photographed in-situ. Positioning Somerset House as a brand was quite a challenge. It is a building, public space, a venue for public events and home to galleries and restaurants. In some cases, it owns an event or a location, and in others it is a partner and has a secondary role. The verbal identity aimed to solve this through the use of the phrase ‘At Somerset House,’ allowing to build the brand in conjunction with other parties. Rather than presenting two competing brands, they work together in harmony. Brand guidelines took special care with the typographic choices; they were conceived to add contrast but also to allow flexibility within the brand. Events targeted at different audiences can tailor their message and engage them while graphically preserving a consistent voice. Art direction by Neville Brody collaborating with RS Nick Hard.